Looking for something to do this weekend? Head to Statesville, NC, for an amazing one stop shop hop! 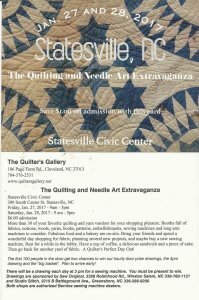 The Quilting and Needle Arts Extravaganza features over 30 vendors under one roof for your shopping pleasure. You'll find fabrics, notions, wool, yarn, books, patterns, embellishments, sewing machines, and long arm machines as far as the eye can see! This is a wonderful opportunity to explore different sides of your creative world. Hurry-the first one filled up in a flash! Our project this time is Patches of Life, a new pattern from Quilt In A Day. This dynamic pattern features several variations for you to play with and create your own version. We'll use the new Large Triangle in A Square ruler and an olf favorite, the Triangle Square Up ruler. All retreat supplies are 15% off at Quilt Patch-reserve yours now! For more information contact deborahquilts@hotmail.com. Make hand work a breeze with this handy little over-the-armchair caddy and pincuhsion! Only takes 3 fat quarters, some Decor bond and crushed walnut shells. Create your own winter wonderland as you sharpen your triangle skills the Quilt In A Day way! Class fee includes kit with background & binding fabric, Magic Mountain pattern, snowflake and penguin appliques, Triangle In A Square ruler, and the Delectable Mountains Quilt In A Day book--all in an Eleanor Burns' Stripper vinyl zippered project bag.